Broken bones in the hand are common injuries. Sometimes a broken bone is very obvious but other times, especially in the hand, it is hard to distinguish from a sprain until diagnosed with an x-ray. Dr. Peter G. Fitzgibbons, MD at The Centers for Advanced Orthopaedics: Maryland Orthopedic Specialists Division is fellowship-trained in both orthopaedic trauma and hand surgery, and is uniquely qualified to take care of hand fractures. 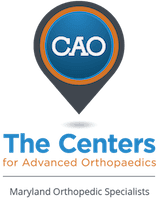 With locations in both Germantown and Bethesda, Maryland, he and a team of orthopaedists, hand therapists, and physical therapists offer a comprehensive range of services covering the diagnosis, treatment, and recovery from hand fractures. Most hand fractures can be treated conservatively (without surgery), and whenever possible, that is Dr. Fitzgibbons’ recommendation. When that is the case, there is usually a period of immobilization in a cast or a splint, depending on the patient and the specifics of the fracture. We have a wide range of options available in the office from pre-fabricated braces to casts and custom-made splints. Once the bone has healed enough, a regular motion is initiated, and when necessary that is overseen by Stephanie Clement, CHT, our certified hand therapist. What is surgery for a hand fracture like? we work to ensure they make the healing process as easy as possible and maximize functional recovery. Dr. Fitzgibbons performs most procedures for hand fractures at the Massachusetts Avenue Surgery Center, an outpatient surgery center that provides a safe, patient-oriented experience in a friendly and comfortable environment.